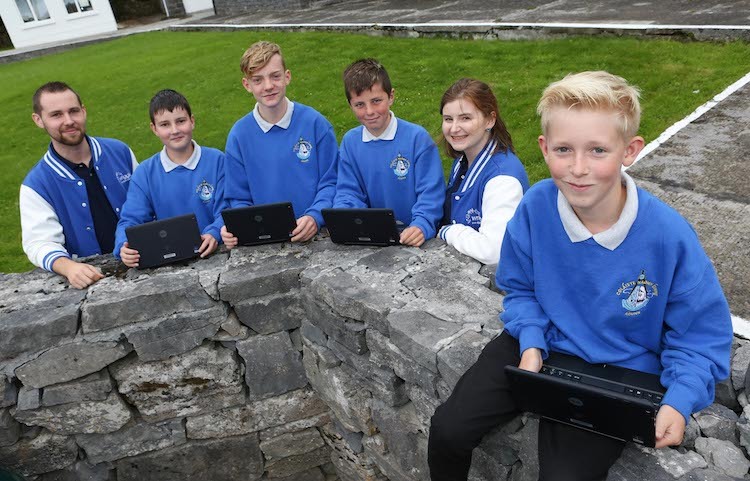 Students at Coláiste Naomh Éinne on Inis Mór have received ‘digital’ schoolbags joining Irish firm Wriggle’s digital learning programme alongside more than 150 schools using 30,000 devices throughout Ireland. The Coláiste is participating in the Wriggle 1:1 programme where students use mobile devices and digital resources for learning. Wriggle supports teachers using technology, helping to foster the digital skills required for the 21st century. Coláiste Naomh Éinne is the only secondary school on Inis Mór and provides full second-level education through the medium of Irish and under the umbrella of Galway and Roscommon Education and Training Board. The school prides itself on welcoming all who want to learn and develop with the ethos ‘gach iarracht, gach cunamh do gach duine’ meaning ‘every effort, every aid, to every person’. The Coláiste uses Microsoft devices. Wriggle Learning was recently awarded the Microsoft Windows and Device Partner of the Year for 2017. Wriggle is a 1:1 mobile learning initiative enabling schools to transform teaching and learning environments. Wriggle has created a complete package, providing the necessary tools and support for teachers and students. Wriggle provides the mobile devices; access to digital textbooks and interactive content; professional development for teachers; comprehensive support and expert advice on ICT planning for schools.